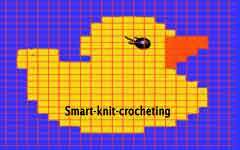 To create a baby knitting pattern is your chance to demonstrate your creativity. Knitting for baby provides you a lot of opportunities to make a masterpiece from nothing. You have to be a little bit brave and not too much conservative to make a baby knitting pattern. As a base, you can choose any regular knitting pattern. Just add some new details to it or change some elements of the original pattern. Just remember that you are going to make knitting for a baby. It means that quality of yarn, its color, and knitting pattern have to play together to make that special look of freshness and fun which always distinguishes good clothing for babies and kids. On this page I began to create a small collection of the baby patterns for knitting. 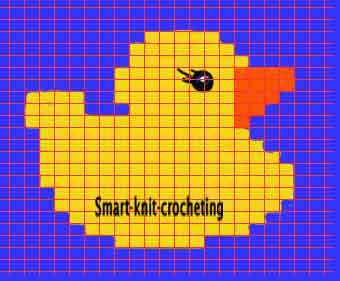 Each baby knitting pattern presented here has a chart and a short description. Check the chart symbols if necessary. A few different techniques are used to make these patterns. But all of them have something in common. They make you smile. Lets look what we have here. Patterns #1 and #2 are worked in stockinette stitch and use three colors. Each color is worked from the separate bobbin. To change colors of the yarn in one row, make the strands across the back side of your knitting. If you don't like to knit using a few bobbins at the same time, there is a simpler alternative, which will produce the same effect. Make all your work in the same color yarn. 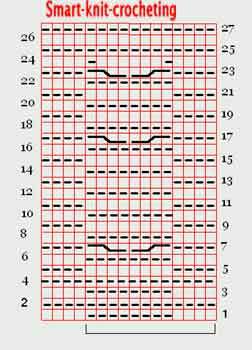 Use duplicate stitch to embroider the chosen baby knitting pattern. 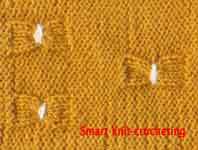 The embroidery strand should be long enough to cover the necessary area of the pattern. 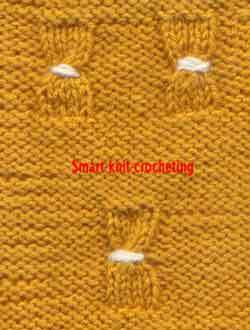 To make a duplicate stitch: bring the yarn from the back of the work, leaving a 3-4 in long tail. The needle should emerge at the lowest point of the "V" noticeable in every stockinette row. Follow the stitch path up to the right leg of the "V". Slip the needle horizontally behind both legs of the stitch above. Follow the left leg of the "V" back down to the point. In the table below short description can be found for each baby knitting pattern. For pattern #1 - #2 dimensions of the pictures are given for the gauge: 1 cm = 1.8 st, 1 cm = 2.4 rows (Note: 1 in =2.54 cm). Do not bother with gauge too much. If your gauge is a little bit different than mine, you will have your picture slightly squashed (short) or elongated (tall). You won't have any distortion, but only picture size change in case if the ratio: vertical gauge/horizontal gauge is equal to mine - 1.33 (2.4/1.8 = 1.33). It is not a bad idea to embroider eyes or use the eyes for the dolls which can be found at your local craft store. It will add brightness and expressiveness to the pattern. Gauge:1 cm = 1.8 st, 1 cm =2.4 rows. Click for chart. (new window opens). Note: 1 in = 2.54 cm. 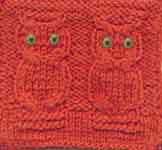 Each owl is 10 cm x 5 cm. Gauge:1 cm = 1.8 st, 1 cm =2.4 rows. To look at the enlarged picture, follow the Knitting Instructions link at the bottom of the page. Click for chart. (new window opens). Pattern 4.To make swatch: Multiple of 16 stitches + 1. Use a needle or crochet hook to wrap a contrast strand around the narrowest part of the cable. Click to enlarge picture. (new window opens).